Digital transformation is not about technology – it’s about change. In the rapidly changing digital economy, you can’t succeed by merely tweaking management practices that led to past success. And yet, while many leaders and managers recognise the threat from digital – and the potential opportunity – they lack a common language and compelling framework to help them assess it and guide them in responding. They don’t know how to think about their digital business model. 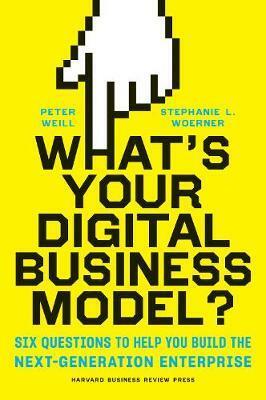 In this concise, practical book, MIT digital research leaders Peter Weill and Stephanie Woerner provide a powerful yet straightforward framework that has been field-tested globally with dozens of senior management teams. Based on years of study at the MIT Center for Information Systems Research (CISR), the authors find that digitisation is moving companies’ business models on two dimensions: from value chains to digital ecosystems, and from a fuzzy understanding of the needs of end customers to a sharper one. Looking at these dimensions in combination results in four distinct business models, each with different capabilities. The book then sets out six driving questions, in separate chapters, that help managers and executives clarify where they are currently in an increasingly digital business landscape and highlight what’s needed to move toward a higher-value digital business model.